Dec. 22, 2017. Yesterday the Clare County Council announced their approval of the Trump International Golf Links (TIGL) proposal for two seawalls at Dougnmore Beach. The approved project would allow two seawalls (630 m & 260m) to be built on a public beach to provide ‘coastal erosion management’ for Trump’s private golf resort. 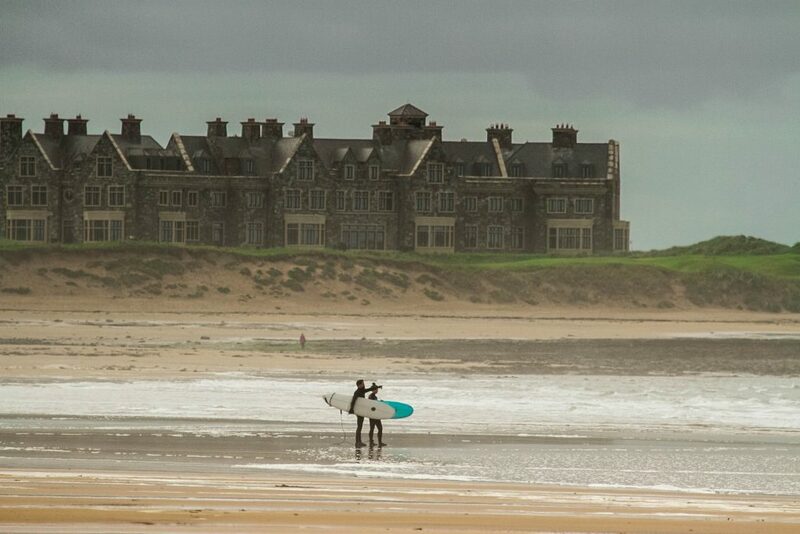 Doughmore Beach is western Ireland’s most consistent beachbreak and very popular with surfers and beachgoers. The appeal will be lodged by January 26, 2018 and should be settled within four months. That decision may only be challenged by way of a Judicial Review to the High Court. Save The Waves successfully launched the #NatureTrumpsWalls campaign in 2016 to oppose TIGL’s original 3km seawall proposal. Through that campaign and alongside our local partners we delivered over 100,000 petition signatures to the local council demonstrating vast opposition to the project. In response to the public outcry, TIGL rescinded that proposal. Stay tuned for updates and consider contributing to the campaign here. Special thanks to our local partners and technical advisors on this project who have been instrumental. Please considering making a donation to help support the legal appeal proceedings. Thank you!